Parnassus’s ongoing documentation of the little-known early period of Sviatoslav Richter’s career continues with a monumental, mostly unpublished Beethoven recital from 1951. In one concert, lasting nearly two hours, Richter played Beethoven’s Two Rondos, Op. 51; the “Eroica” Variations, Op. 35; the Sonata No. 12, in A Flat, Op. 26; the Bagatelle, in F, Op. 33, No. 3; and the Sonata No. 27, in E Minor, Op. 79. He then completed the program with the “Diabelli” Variations, Beethoven’s largest work for piano. While there are well-known recordings of Richter playing the “Diabelli” Variations from 1971 and 1986, this is the earliest documented performance of his playing of the music. Of the material in this concert, only the “Diabelli” Variations has ever been published before, in a domestic Korean edition which was not exported to other countries. (The original CD edition was coupled with a performance by another pianist.) The remaining material from this concert has never been published in any form. The second disc of this set is completed with two further sets of Beethoven Variations: the Variations on an Original Theme, Op. 34; and the “Turkish March” Variations, Op. 76. Both works figured in Richter’s later repertoire, but these early performances, from 1950, have circulated only in a limited CD-R edition briefly available through an internet site. 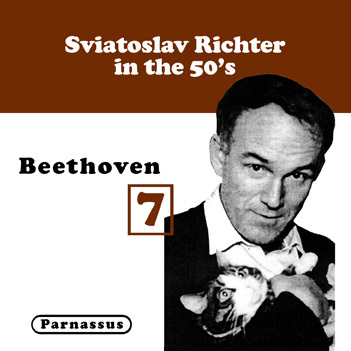 While Richter’s performing career outside the Soviet bloc countries began in 1960, by 1950 he was already a concert artist with more than a decade of performing experience behind him. The performances on this disc, while “early” in terms of the Richter discography, are still those of a mature artist at the peak of his technical and musical abilities. They are presented in gratifyingly good sound for their period. “…Then again there is Maestro Richter. I’m sorry to say I gave away my Philips recording of his Diabellis, thinking that I could do very well with Brendel’s 1990 for Philips. This release offers a concert performance from January 29, 1951, in Moscow, and the label’s packaging claims that it has only appeared once before, in Korea. How glad I am to have it! The performance lasts only 44 minutes, leaving me to wonder how Richter could manage it: would all the variations be painfully fast? Not at all. But some are very fast (including 12 and 26); and there’s always a musical reason for the tempos that, I gather, has to do principally with Richter’s sense of the work’s architecture. In one case (Variation 8), the fast tempo blurs the strange chromaticism in the bass so that the odd passages sound more like splashes of color than awkward, unwieldy embellishments; I no longer would want to hear this variation played any other way. Most stunning, perhaps, is Richter’s sense of humor in the final variation. This is so very difficult to manage; a further step in one direction leads to a kind of arrogant irony that’s out of place, while a step in the other makes the music sound flabby and sentimental. And while Brendel and Paul Lewis can err towards the sentimental and make it sound like autumnal serenity, Richter stays right in the middle and the piece shines: such delicate humor at the end of such a monumental work makes me fall in love with it all over again. Leslie Gerber and his Parnassus label have certainly shown constant devotion to Richter these many years. This latest volume is the seventh in the series and its existence is owed to the anonymous generosity of an individual who made the recordings available for publication. There are two Moscow recitals, one from June 1953 and the other from January 1951. Each disc lasts just over an hour. A number of these surviving performances are valuable not least because, despite the many examples that exist on disc, whether studio, live or private, these early recitals mark a first staging post in the appreciation of his art. For example, I am not aware that the two Rondos survive in performances earlier than the 1980s, though I’d wager in years to come that other recitals emerge from the intervening years. For now there is a three decade lacuna. Similarly my earliest prior experience of the Eroica variations was from as late as the 1968 performance, once on the AS label. There are other examples from 1970 – from NYC on Intaglio, from Venice and Salzburg. But, again, this Moscow one is by some way the earliest so far documented to have survived. It’s a characteristically driving affair, sometimes a little too much so for the ultimate in characterisation and balance. The recording remains very clear and the audience is remarkably quiet. The A flat sonata Op.26 is better known from later live recitals – not least Prague in 1959, the two New York efforts the following year and several others. This 1951 performance is worthy to be judged alongside them. There’s a bit of confusion in the notes regarding the opus number of the E minor sonata (it’s not Op.79 but 90) but that’s hardly relevant to the playing which is convincing, despite a few slips. Disc two preserves a continuation of this recital and part of the June 1950 recital. The disc focuses on the Diabelli variations, adding the Variations on an Original Theme from June 1950 and encoring with yet another variation – this time on a Turkish March: thematic programme building with a vengeance. Again, this Diabelli marks a quantum leap backwards in the pianist’s discography if the 1970 Venice performance represents the hitherto earliest survivor. Prague and Amsterdam in 1986 also marked late examples. This youthful, fiery rendition is sweeping, or gaunt, and dramatic, with sufficient breadth to ensure unfluctuating fascination with both tonal nuance and rhythmic incision. The Variations on an Original Theme is taut and leonine. Altogether this exclusive focus on Beethoven nourishes Richter’s early discography significantly.